The house is set over two floors and is connected to mains water and electricity. There are also two wells on the property. The main house has a footprint of 100 square meters and is set over two floors. The ground floor of the house consists of three large storage rooms. To each side of the house there are stone steps leading to the first floor. The main entrance to the house opens to a centralized corridor. The right, there is a living room and a bedroom, and to the left there are two bedrooms and between them a recently installed partially tiled bathroom with toilet, bidet, pedestal sink, bathtub and shower cubicle. In one of the bedrooms there are wooden stairs to the attic. To the end of the corridor there is a large rustic kitchen with a window front. From the kitchen there is a veranda and stone steps leading to the ground. The attic has standing height and is ample and could easily be converted into more living space. The roof structure is in good state of repair. The floors and ceilings of the house are wood and need some attention. Next to the house there is a large slate covered threshing circle. There are three annexes next to the house measuring a total construction area of 130,40 square meters; one is the house of the bread oven, ther other is the winery and the third is a storage room. There is yet a fourth annex which is the ruined hay barn. The property is located on a quiet tarmac road with little traffic and there is a high stone wall with a large double winged metal vehicle entrance gate. The plot which comes with the house measures 15,688 square meters and there are two large wells on the land, one near the house and the other at the far end of the land. There are many mature olive trees, cork oaks, pine trees, apple and orange trees, arbutus shrubs and vines on the land. The land is relatively flat and very fertile and was used to crop a large variety of crops. There is vehicle access to the far end of the land. 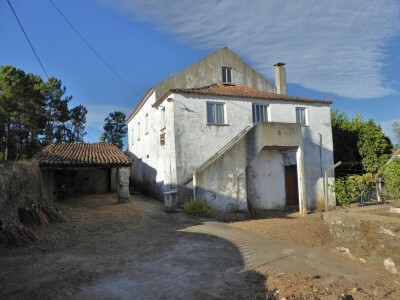 The property is located in the village of Nesperal, where there are two cafés. It is three km from the center of the town of Cernache do Bonjardim, which cafés, bars, shops, mini-market, pharmacy and schools. The larger town of Sertã is six km away. Sertã has several supermarkets, shops, restaurants, banks, indoor and outdoor pools, a public library, schools, health centers, café bars, parks and municipal buildings and is easy to access off the IC8 dual carriageway. The closest airport to the property is situated at Lisbon, which is around two hours and ten minutes. Lisbon airport is serviced by a variety of low cost airlines, which operate regulars flights to and from the United Kingdom and other European countries.